MacLeod Optical & Vision Centre is a 100% locally owned and operated by Robert MacLeod offering comprehensive eye examinations, eyewear and colored contact lenses. Our licensed opticians will recommend just the right frames to compliment your appearance and lenses to improve your vision. 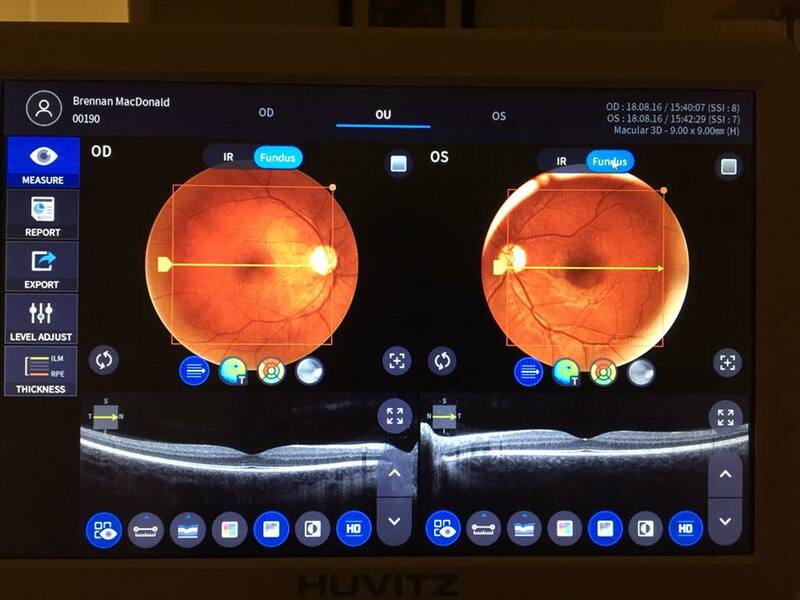 MacLeod Optical & Vision Centre’s business model is to provide a friendly and efficient level of customer service unmatched by our competitors. Read more about our staff. Our customers come from all over Cape Breton, knowing that they’ll get the finest eye care and eyewear in the area. MacLeod Optical & Vision Centre is committed to providing quality eye products and services using the latest digital technology in our lenses and lenses treatments. MacLeod Optical & Vision Centre recently acquired an OCT scanner. Optical Coherence Tomography (OCT) captures an image of all the layers of the retina and optic nerve. This allows us to monitor for such conditions as macular degeneration and glaucoma. We offer OCT imaging as part of all of our comprehensive eye exams. Don’t forget to ask our Opticians for details about our 2-for-1 options! Come see us for the finest quality eyewear that wears well! Book your appointment today with one of our optometrists, Dr. Brennan MacDonald or Dr. Ashley Chiasson, and be sure to look for ongoing promotions on our Facebook page! MacLeod Optical & Vision Centre only employs experienced opticians. Learn more about how our professionals care for your vision needs. Plan your next eye exam appointment, or ask us about our frames!